Evelyn Moore is only 13 months-old, yet she has endured more in her short life than most ever will. Diagnosed with a stage 4 neuroblastoma tumor on her spine at four months-old, Evelyn went through eight rounds of chemotherapy, and thankfully her cancer is in remission. However, although the young survivor is cancer free, she is now permanently paralyzed below her arms. 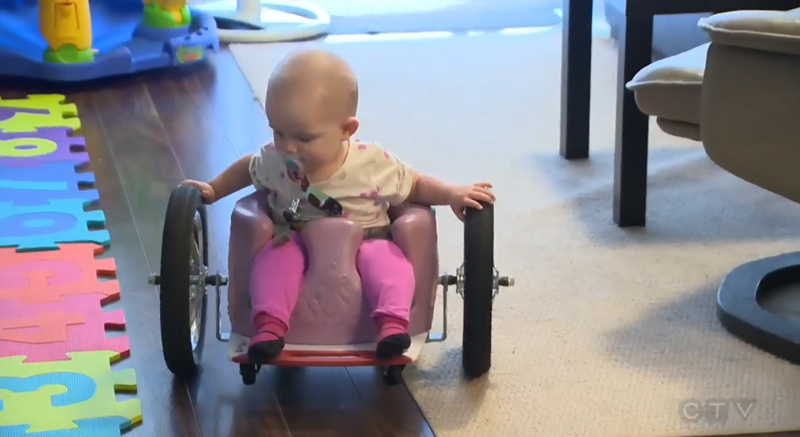 Doctors told her parents that she would likely have to “army crawl” to get around since she is too young and small for a wheelchair. That answer didn’t sit well with Moore’s parents, who took it upon themselves to build her a wheelchair on their own. The result is beyond resourceful, innovative and astounding, given Evelyn’s mobility and ability to maneuver herself independently. After one long night of work using a Bumbo seat, a kitchen cutting board and bicycle wheels from a child’s bike, The Moores produced this ingenious piece of equipment that makes their daughter “unstoppable,” for around $100. What an inspiring story and a reminder to not take every answer at face value — but to push the envelope to do what’s best for your child, even if that means inventing the solution yourself. Evelyn Moore is only 13 months-old, yet she has endured more in her short life than most ever will. Diagnosed with a stage 4 neuroblastoma tumor on her spine at four months-old, Evelyn went through eight rounds of chemotherapy, and thankfully her cancer is in remission. However, although the young survivor is cancer free, she is now permanently paralyzed below her arms. Doctors told her parents that she would likely have to "army crawl" to get around since she is too young and small for a wheelchair. That answer didn't sit well with Moore's parents, who took it upon themselves to build her a wheelchair on their own. The result is beyond resourceful, innovative and astounding, given Evelyn's mobility and ability to maneuver herself independently. After one long night of work using a Bumbo seat, a kitchen cutting board and bicycle wheels from a child's bike, The Moores produced this ingenious piece of equipment that makes their daughter "unstoppable," for around $100. What an inspiring story and a reminder to not take every answer at face value -- but to push the envelope to do what's best for your child, even if that means inventing the solution yourself.